Experimental Thermodynamics, Volume 1: Calorimetry of Non-Reacting Systems covers the heat capacity determinations for chemical substances in the solid, liquid, solution, and vapor states, at temperatures ranging from near the absolute zero to the highest at which calorimetry is feasible. This book is divided into 14 chapters. 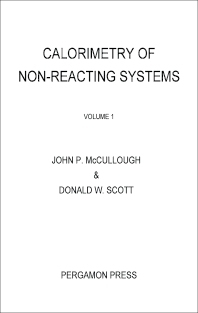 The first four chapters provide background information and general principles applicable to all types of calorimetry of non-reacting systems. The remaining 10 chapters deal with specific types of calorimetry. Most of the types of calorimetry treated are developed over a considerable period and brought to a relatively sophisticated state. For such calorimetry, the approach adopted is to give detailed accounts of a few examples of apparatus and techniques representative of the best current practice in the field. For the few types of calorimetry, a general review of the field was considered more appropriate. This book will prove useful to thermochemists, engineers, and experimentalists.